It can be difficult to evidence to the regulators that you’ve been properly TPS screening and our certificates can help with that. Each certificate carries the name of the file cleaned, the date, the expiration date of the data (28 days from the date of screening) together with a summary of the results including numbers identified on any of your Do Not Call (DNC) lists or those of your clients. Each certificate also carries a unique certification number in the bottom left that allows us to verify its authenticity. If you’re telemarketing on behalf of a client, you can run their file through our system and use the certificate as evidence the screening has taken place. You can use the certificates to demonstrate to your clients the general ‘state’ of their data, including numbers matching any of the TPS, CTPS or FPS registers screened against as well as any internal or client Do Not Call (DNC) or remove lists uploaded to be screened against. You can store the certificates indefinitely as evidence of TPS Screening. 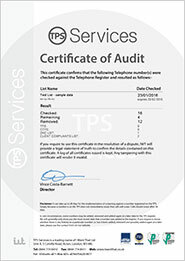 Certificates of Audit is just another way that TPS Services helps its clients deal with everyday TPS related challenges.